Leveraging three decades of bike building, the 2018 Marin Pine Mountain 2 lives up to its own legend. It’s impossible to swing a leg over a Marin bicycle and not feel a twinge of nostalgia. Now more than 30 years old, the California-based manufacturer sprouted from the epicenter of mountain biking just as the sport was taking root. Although it has been in the Marin lineup since the early days, the Pine Mountain has lived through multiple incarnations. Marin released the latest version in 2016. And it now pays homage to the original, updating it with 27.5+ wheels. In its latest form, it is a versatile machine. Whether pushed hard on singletrack after work or loaded heavy for a multi-day tour, it seems to do it all. For the coming season Marin didn’t tweak the recipe too much. It did make a few noteworthy revisions to the Pine Mountain 2. Whereas the brand offered the two previous models in raw steel and silver color schemes, it clads the new bike in Grimace-hued purple paint. Component specs didn’t receive too many alterations. 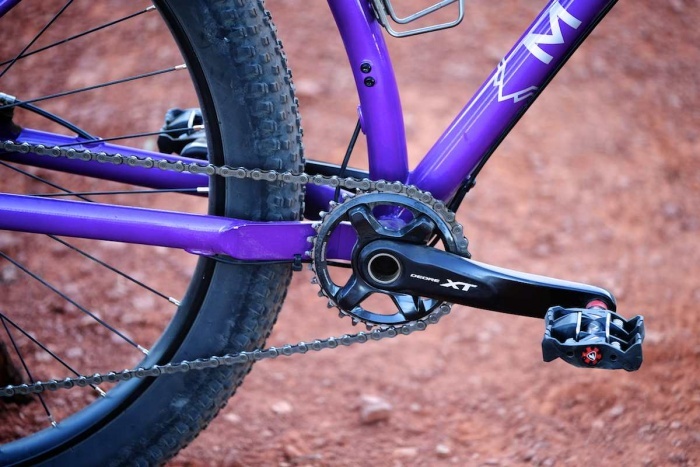 The bulk of the drivetrain still wears Shimano XT labels, and the hydraulic brakes and 160/180-mm rotors remain. In response to pleas for a lower gear ratio, the cassette now has a climb-conquering 46-tooth cog. I have only done one bikepacking trip on the Pine Mountain 2, but the bail-out gear helped me climb with a fully loaded bike. The XT Boost crank comes with a single 32-tooth chainring—because these days front derailleurs are increasingly unnecessary. The biggest change was a fork swap from a Fox Float 34 to a RockShox Pike RC. I also noticed the WTB Scraper rims went from 45mm down to 40mm wide. Not to say the wider rims were too much, but the narrower hoops reduce weight and give the WTB 2.8 Ranger tires a rounded and compliant profile. On the trail, the wheel package felt less like a mid-fat setup and more like a chubby 29er wheel. When Marin released it in 2016, I was stoked to see this top-tier hardtail use Columbus Thron tubing. 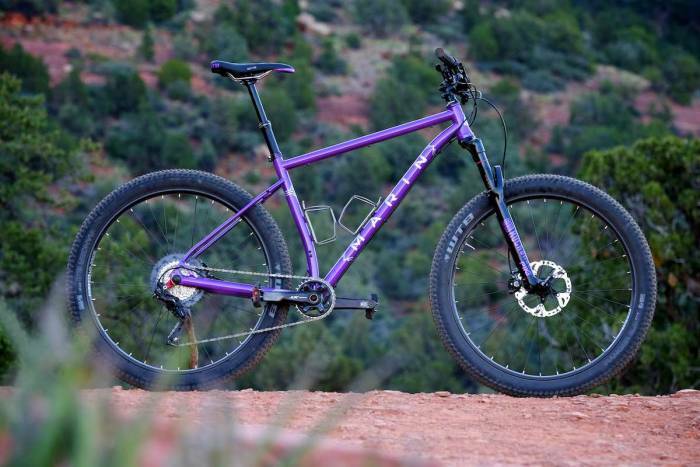 With an estimated 30 percent more stiffness than Reynolds 531 steel tubing, the Pine Mountain’s seemingly pencil-thin chassis is a worthy counterpart to the brawny wheels. Investment-cast dropouts and brake bridge, and a drive-side chainstay member designed to improve tire clearance, augment the frame’s rigidity and add further refinement. The internally routed KS Lev dropper post, rear brake line, and derailleur cable keep things tidy. At the risk of sounding like an old-school pedant, there is a purity and uniqueness to a steel hardtail I have always enjoyed. Not to bestow it with magical properties, but even with a well-tuned fork soaking up the bumps, I feel more connected to the terrain, while not suffering a beating. When faced with punchy climbs, the ability to jam out a few enthusiastic pedal strokes against a firmly planted crank just feels good. On technical trails when things get spicy, the cable-actuated dropper seat post helps maintain confidence to keep rolling. The bottom bracket is just high enough to reduce unexpected pedal strikes. So, while the Pine Mountain 2 might seem dated, the ride experience certainly isn’t. Given its mission as a do-all bike, the 69-degree head tube and 73.5-degree seat tube angles feel nimble when unloaded and stable when kitted with bikepacking gear. After reading the geometry specs, I expected the 437-mm stays to truck wide in tight turns, but, to my surprise, the back half of the bike felt short and snappy. Speaking of short, the abbreviated stem also helped amplify responsiveness, maybe to the point of nervousness. Given my high ape-index (long arms), I swapped it out for a bit more length. The 780-mm riser bars offer enough width and leverage to yard hard when pushed into an aggressive turn. Plus, they prove solid when sawing side to side on angry climbs. Steel has fallen in and out of favor several times in cycling. For now, it appears to hold its own. The Pine Mountain 2 represents the best of what the material can do. The sublte undertones in the ride quality speak to the rich history of Marin, but it still feels modern and relevant. Not everyone will like the added squish of the plus-size tires, but they work for me, particularly when the bike is heavily laden. On the whole, there is very little I would change with the 2018 Pine Mountain 2. I’d make mostly minor adjustments to better suit my preferred terrain and riding style. Along those lines, I might trade the tires for something meatier like the Terrene Chunk or newly released Teravail Cumberland. With my penchant for long rides, I would have liked to see an additional bottle mount below the downtube, but that’s getting picky. Other than that, I just wish they could have made it more—purple.